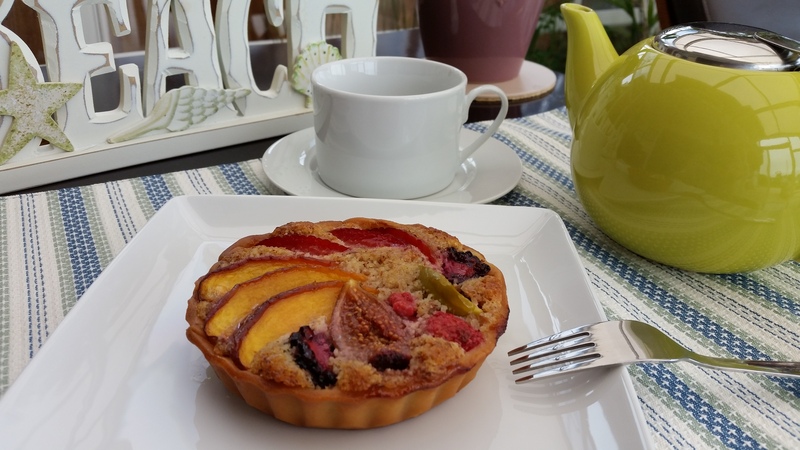 I love fruit tarts, fresh or baked. 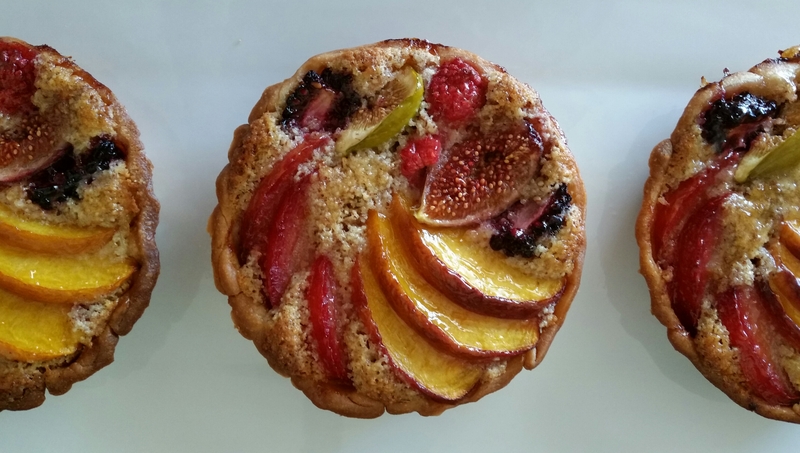 I love the frangipane (almond filling) in baked fruit tarts, and this recipe from Tartine is surprisingly easy if you use almond meal. I cut down the sugar by one-quarter compared to the original recipe. 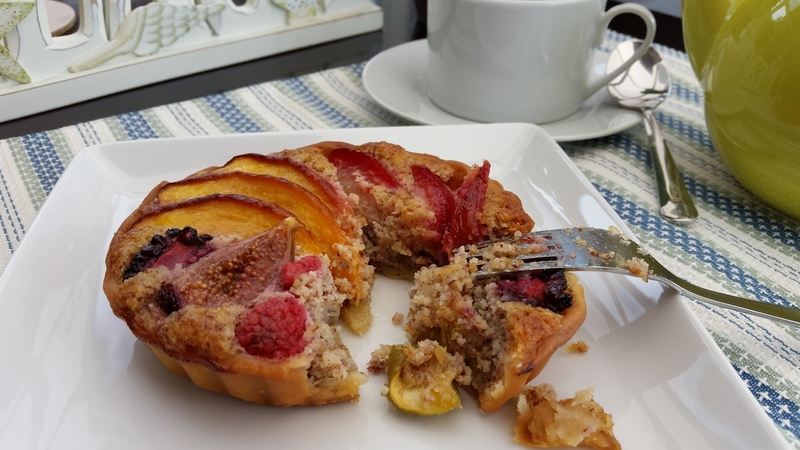 The crisp sweet tart shell, textured almond filling, tender and tart peaches and berries made a heavenly combo! Fruits of your choice. I prefer fruits with tartness, such as peaches, plums, berries. 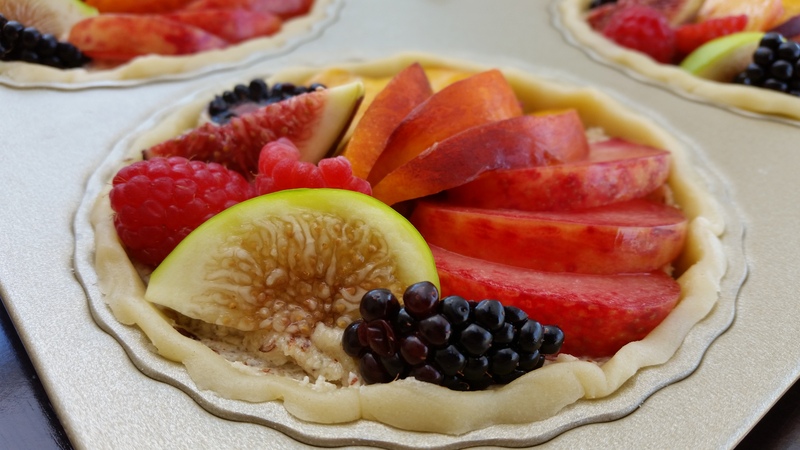 Cut peaches, plums into slices however you want to decorate the tarts. Cream butter, sugar, and salt in a standing mixer fitted with the paddle attachment. Add in one egg, mix until incorporated. Add the second egg, mix again until smooth. Add the flour all at once and mix on low speed until just incorporated. On a lightly floured surface, divide the dough into four equal balls. Flatten each ball with your palm into 1/2 inch disks. Wrap and separate the discs using parchment paper or plastic wrap. Chill at least 2 hours or overnight in the refrigerator. This recipe makes much more dough than needed to make 6 tartlets. Wrap the remaining dough well and freeze; they come in handy when you bake again the next time. Always thaw dough in the refrigerator overnight before using them again. Mix almond meal with 50g sugar in a bowl. In a standing mixer fitted with the paddle attachment, cream the butter on medium speed until creamy. Add the remaining sugar (100g) and mix until incorporated. Add the almond/sugar mixture and beat until thoroughly combined. Add the salt and brandy and one egg. Mix until incorporated. Add the second egg and the milk. Mix until light and fluffy. Remove the thawed/chilled dough disc from the refrigerator one at a time. Roll out the dough to 1/8 in thick on a lightly floured surface, turning a quarter turn after every few strokes to prevent the dough from sticking to the surface. Cut circles that is 2 inches larger than the tart molds. Transfer the cut dough carefully over the mold and ease the dough into the bottom and sides and press gently into place. DO NOT stretch the dough or they will shrink during baking. Repeat with remaining dough until all the tart shells are ready. 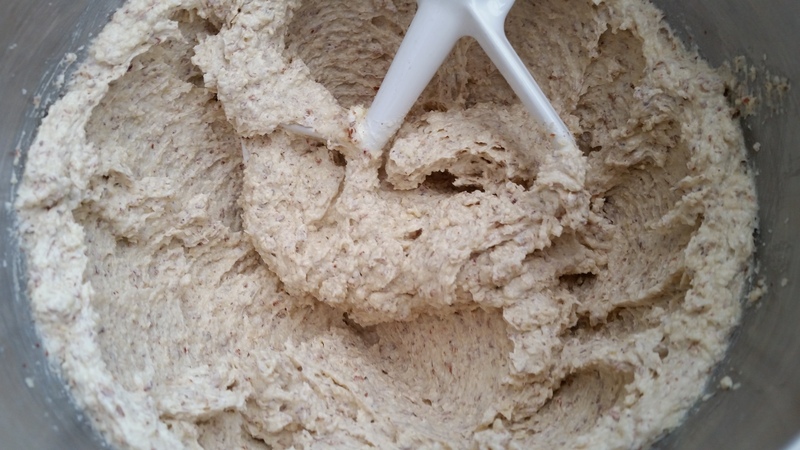 If the dough becomes too soft to handle, return to the refrigerator until ready to use again. 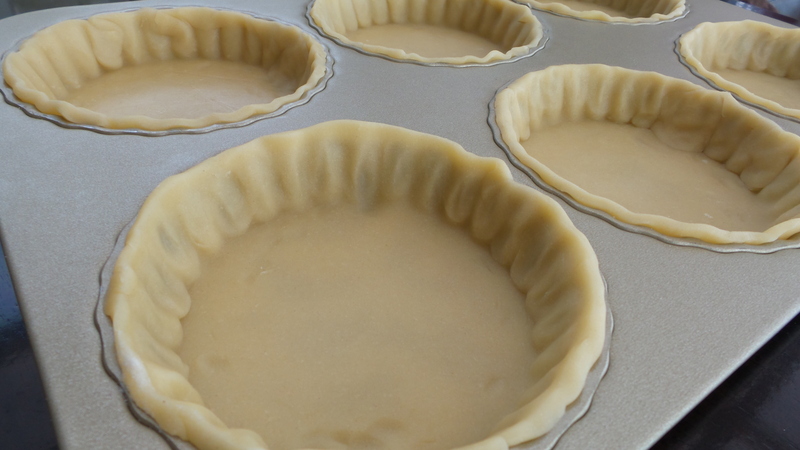 Chill the tart shells for another half hour until they are firm again before filling. Fill the tart shells with frangipane cream, smoothing the top with a spoon or spatula. Arrange the fruits on the frangipane cream. The cream will rise and fill the gaps in-between the fruits. Bake in the oven for 40 minutes until the filling has risen and is firm to the touch. The fruits should be tender. When the tart is baking, warm the apricot jam in a small sauce pan until it is liquid. 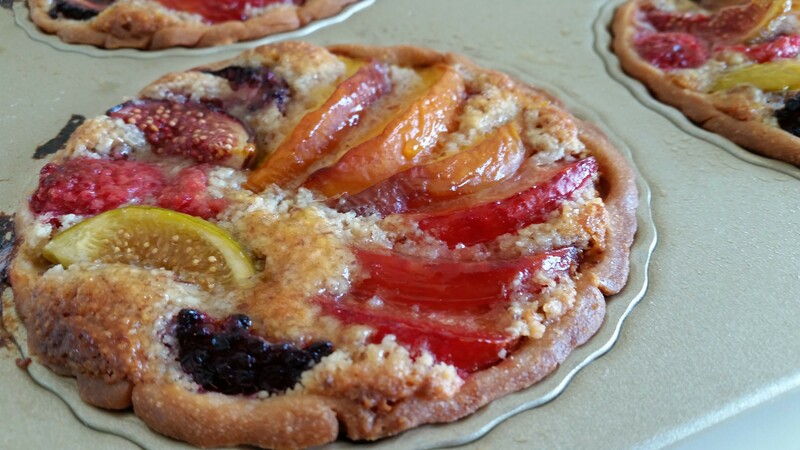 Brush each tart generously with the apricot glaze when it comes out of the oven. 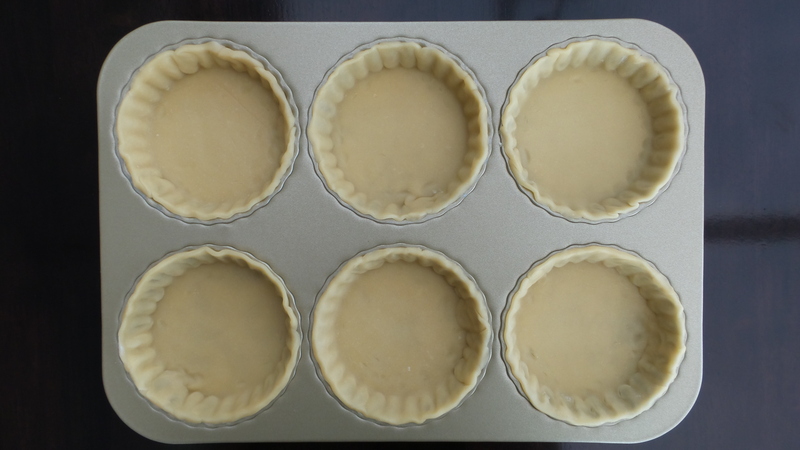 The tarts will keep in the refrigerator for up to 3 days. 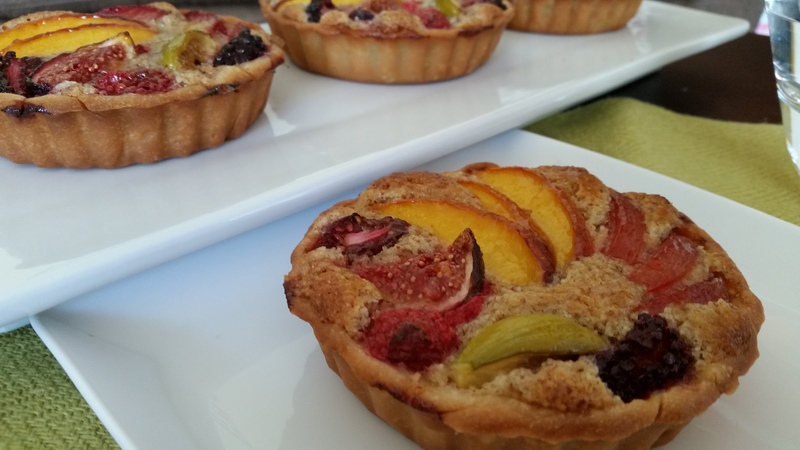 Enjoy the beauty and tastes of these gorgeous tartlets.